Carol Dean Sharpe, who owns and operates an Etsy shop under the name SandFibers, is one of the most prolific beaders I know. 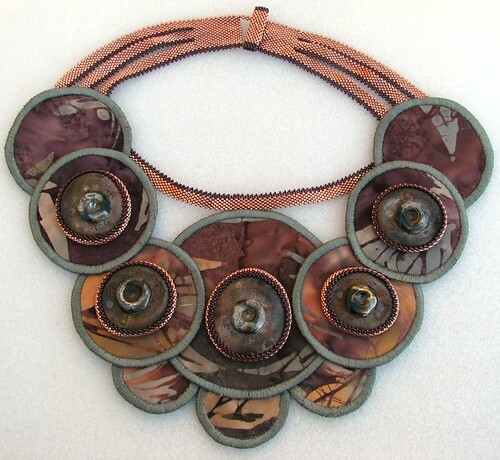 She spends her days creating amazing, beautifully designed peyote stitch cuff bracelets and one-of-a-kind necklaces using ceramic art cabochons and gemstone donuts. 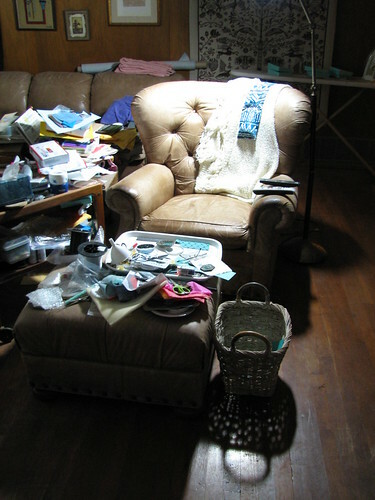 "I prefer to state that my easy chair and ottoman in our den constitute my 'beading studio.' The truth is, as usual, somewhere in between. Because I was a quilter before I ever picked up a bead, we turned one of our guest rooms into a dedicated quilt studio (glorified sewing room). Sadly, over the last few years as beading has taken control of my waking life, this room has become more of a (very messy) storage closet for my fabrics and yarns and less of a work space. I can still find my way to the sewing machine when I really need it. 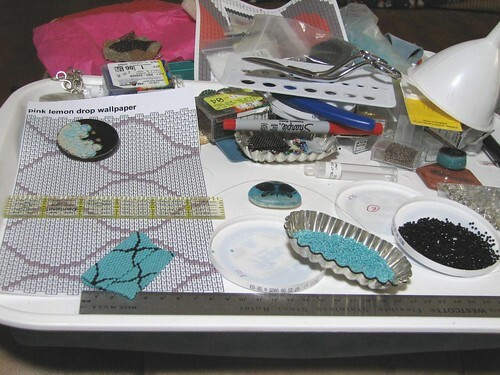 "I do all of my beadwork seated in my big leather chair, either "hunched" over my bead tray/lap desk on the ottoman if I'm working on an involved pattern or with my legs on the ottoman and the bead tray on my lap if I'm working on a pattern that requires less focus. Our tv is always on as background noise and a spot on which to rest my eyes when they need a break from those crazy small beads I use. I cannot bead in silence; my mind gets too busy to focus on my work. Since I'm constantly feeling the pull of the computer (etsy, facebook, twitter, blogs), I get up regularly, "stretch," and walk to the office. Lots of traffic between the den and the office at Sand Fibers." Carol goes on to say that her workspace can be described as "organized chaos" - she can (almost) always find what she's looking for. But no one else would be able to find anything. Despite the mess, Carol says that because so much of her stuff is out in the open, it's there to yell at her when it's ready to be used. She said, "I don't know if that makes sense. I could open a small store with all the art beads and buttons I have acquired without specific projects in mind, just because I "had to have them." Now that they are all lined up in these wonderful bead trays, I can visit with my "eye candy" easily (and quite regularly!) and when a bead is ready for me, it lets me know. Before the trays, I had everything in bags and/or bubble wrap tucked away in boxes, and I would have to go on targeted searches for a specific bead. "Having things in jumbles (in my bead towers) and piles (of fabrics and yarns) can result in surprising juxtapositions of colors and materials. Design by accident is still design, right? If I'm really stumped for inspiration (which doesn't happen often, thank goodness), I can just wander around my house and visit with my various stashes, all of things I love (why else would I have them? ), and something will set me on the right course." Of course, all that mess doesn't seem to hurt Carol's creativity, as you can see in some of her unique one-of-a-kind pieces that combine beadwork with fabric. You can read the full interview with Jennifer Cameron on her blog, Glass Addictions. Thanks to Carol and Jennifer for allowing me to post clips and photos from that original blog post! 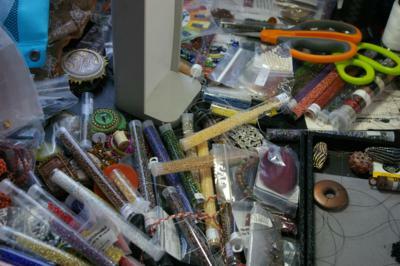 Can't say I've ever gotten that messy but there are beads scattered all over my floor from me dropping them as I work. Before I vacuum I have to comb the floor to make sure they don't get lost forever!